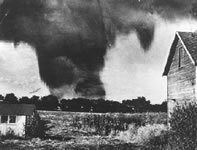 The Ruskin Heights Tornado was part of the the Central Plains Outbreak of May 1957 is a tornado outbreak that took place across the US Central Plains from May 19 to May 21, 1957. The F5 tornado that was included in this outbreak and the most significant, is often called the Ruskin Heights Tornado according to people in the Kansas City area as the worst of the damage occurred in the Ruskin Heights area, a suburb and housing development south of Kansas City. 50 tornadoes were reported from Colorado to the Mississippi Valley and 59 people were killed during the outbreak including 44 from the Rusking Heights tornado. The tornado touched down shortly after 6:00 PM CDT in Williamsburg, Kansas and lifted about 71 miles (113.6 km)later just outside the town of Little Blue, Missouri southeast of Kansas City near the interchange of Interstates 70 and 470. Thirty-nine people were reported dead with in the first forty-eight hours, with five more dying from injuries over the years. The tornado hit the areas of Ottawa, and Spring Hill, Kansas before hitting Martin City, part of Grandview, Hickman Mills, Ruskin Heights (a huge subdivision), and Knob Town, Missouri. The 71 mile path leveled numerous houses and businesses. At one point the F5 tornado was over a mile (1.6 km) wide, but as it went through Ruskin Heights, the funnel was about three to four street blocks wide. One of the oddities was that the tornado hit a water tower head on, and passed through it, without any damage to it. But, across the street it leveled both Junior and Senior High Schools, and houses located in Ruskin Heights. Today, there is a memorial located at the entrance to Ruskin Heights (111th and Blue Ridge) commemorating those who were killed.